A study in the journal Earth and Planetary Science has questioned the origin of a Moon rock sample collected during a 1971 NASA Moon landing. The startling study published this week has found the Moon rock’s chemical composition is much closer to Earth rock than it is to Moon rock. Researchers have found traces of quartz in the Moon rock – a mineral typically not found on the Moon. The Moon rock sample in question was collected by NASA’s Apollo 14 mission, which saw astronauts Alan Shepard and Edgar Mitchell land on the Moon. The rock was then loaned by NASA to Curtin University in Western Australia where it was analysed by a team of international researchers. The researchers have now suggested the rock made its way to the surface of the Moon after an asteroid slammed into our home world billion of years ago. Research author Professor Alexander Nemchin, from Curtin’s School of Earth and Planetary Sciences, said in a statement the tiny 1.8-gram sample of Moon rock is similar in composition to granite. The expert said: “The sample also contains quartz, which is an even more unusual find on the Moon. Based on the rock’s chemical composition, Professor Nemchin concluded the zircon formed at a low temperature. The rock most likely also formed in the presence of water and oxygen, further suggesting it came from Earth and not the Moon. He said: “It is possible that some of these unusual conditions could have occurred very locally and very briefly on the Moon and the sample is a result of this brief deviation from normality. The Apollo 14 lunar mission was a nine-day-long mission to the Moon which blasted off from Earth on January 31, 1971. The mission saw Commander Alan Shepard, Command Module Pilot Stuart Roosa, and Lunar Module Pilot Edgar Mitchell leave Earth in a Saturn V rocket. NASA’s astronauts spent a total of two days on the surface of the Moon, collecting samples of Moon rock and seismic readings. 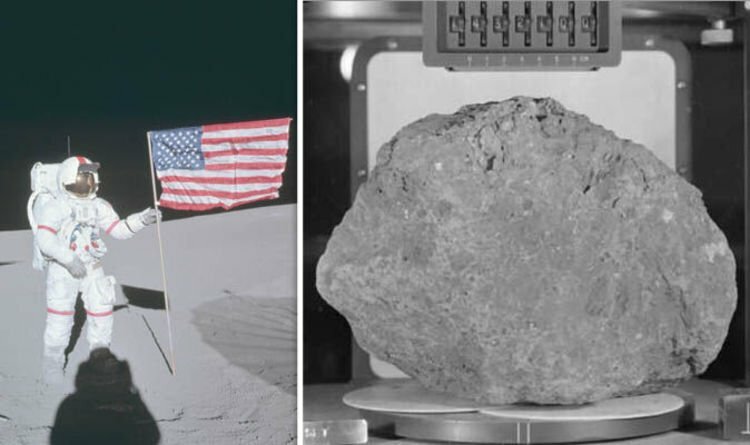 Overall, NASA collected 45kg (100 pounds) worth of rock from the Moon to study back on Earth. The Apollo 14 crew returned to Earth on February 9, 1971, and splashed down in the South Pacific Ocean for recovery.